Rachel Ann Morgan sings and plays various harps in the bardic tradition, in Celtic music from Wales, Scotland and Ireland. 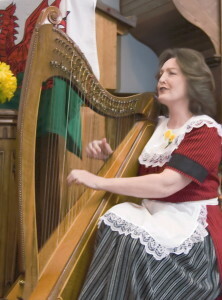 Born and brought up in a Welsh-speaking family in Cardiff, Wales, Rachel Ann Morgan plays the Celtic harp, the Concert harp and the Triple harp, also known as the Welsh harp. She sings accompanying herself in her mother tongue, Welsh, as well in English. The harp is the national instrument of the Celtic countries and is the basis for their folk music. Many accomplished singers come from Wales, which is known as the Land of Song. Rachel Ann is a classically trained singer and harpist who returns to her roots in this programme of traditional Celtic music.